How do I know if I am getting power to my Plug and Play spa? There is a test button and above it a reset button on the GFCI power cord. When the GFCI is fully functional, the red light on the GFCI cord will be on indicating power to the spa. I am getting power, but spa not working. If the system fuse blows (0.3 amps) then the topside control panel will not light up, so the fuse needs to be replaced. My Aux button does not work. All plug and play spas have an Aux button on the panel that is inoperative. It is a generic panel that includes an additional function not used on plug and play models. This is similar to blanks that are in automobiles that do not offer certain features or functions. 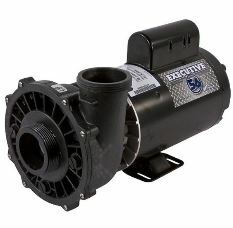 What should I do if my spa pump is humming? If the pump does not pump any water, see if there is an error message on the panel. If the control panel shows an error message DR or DY, that means the heater is dry, so you may need to manually prime the pump or heater tube. This process involves slightly opening a union to allow water to start coming out, thereby eliminating any trapped air bubbles. This usually may occur on a brand new fill. Pumps are self-priming, but sometimes an air pocket can cause priming issues and the resulting dry heater error. This is a safety mechanism to avoid the heater tube from becoming too hot. Always call for assistance if there are any issues that are unclear. Most of the issues may crop up on brand new installations or refills as procedures are not understood until becoming more familiar with the spa. Generally, once the spa is full of water and the power has been hooked up safely and correctly, there is little to do but turn it on and enjoy! Proper water chemistry will go a long way to avoiding any mechanical problems or eroding seals and also provide for a safe and fun water environment for the whole family. Contact the folks at Hot Tub Outpost with any questions or to order replacement parts, filters, chemicals, covers or accessories. 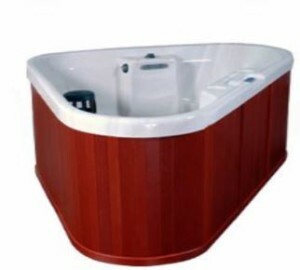 Not all 110-120 volt spas can be converted to 220-240v operation, but a select few of QCA Spas plug and play models such as the Mystic, Riviera and Star Gazer. When a plug and play spa operates at 120v, the heater (if the spa has one) is mostly a 1kw heater. By converting one of the convertible plug and play spas to 220-240v operation, you make the heater a 4kw heater without needing to actually replace the heater. Will the spa use more power at 240v? No, because the recovery time and initial heat up time is 1/2 the time. The only thing you are converting is the heater. The pump still operates at 120v even when the spa operates at 240v. So the benefit of operating the spa at 220-240v is that the heater works better. On a plug and play spa, the heater is convertible to 240v by removing a white wire and switching a dipswitch on the circuit board. Your electrician can do this conversion in a few minutes. The steps are to power down the spa, unplug the spa. Remove the power cord by unscrewing the connections on the terminal block on the circuit board. Then remove the jumper wire from the “Red AC” section. Move the number 10 dipswitch down and that converts it to 240v. Your electrician will then bring in the neutral, 2 hot wires and a ground wire and you are good to go. See the diagram in the video for how to wire up a GFCI at 240v. When inside the power control box, do not move the red, factory preset dipswitches. The only dipswitch that needs to be adjusted when converting from 120v to 240v is the last one in the row (dipswitch #10). Do not move any of the other dipswitches at any time without calling for assistance. 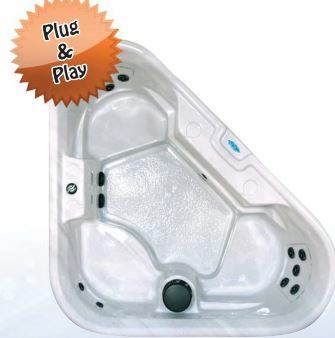 Not all 120 volt spas are convertible, so be sure you have a QCA Spas convertible 120 volt plug and play model before attempting to hook it up to 220-240 volts. 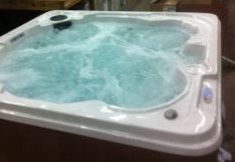 As of the time this article was written, the only types of spas that accommodate this upgrade are the Mystic, Riviera and StarGazer type spas. Replacing a pump seal requires removing the plug that covers the motor shaft. Use a hook tool to hook the impeller to avoid it turning. When holding the impeller, turn the motor shaft screw counterclockwise and loosen the impeller. Remove the 4 through bolts that hold the motor to the wet end. These are usually 5/16″ heads that run all the way through the motor to the wet end. Once removed, the wet end falls off revealing the impeller inside and providing access to the pump seal. 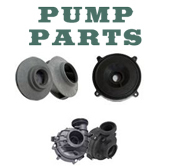 Be sure to have ordered the right pump seal kit ahead of time for replacement once pump is taken apart. Insert the pump seal kit per directions that come with the kit and then replace the impeller and wet end, tighten through bolts and reinstall the pump. The problem with pump seals is that they are susceptible to chemical damage by out of balance water. That is why it is imperative that the pH in a hot tub is kept between the desired range of 7.2-7.6 which is slightly basic. This keeps it out of the acid range and hence avoids eating at pump seals which in turn can cause a leak at the pump. Regular inspection of spa pumps can provide early warning of a leaky pump seal and if the seal is replaced in a timely manner, pump replacement can be avoided. Need a replacement wet end, you can get those too at Hot Tub Outpost USA.